Rica Peralejo realized the profound message behind the traditional wedding vow: "...to have and to hold, from this day forward, for better, for worse, for richer, for poorer, in sickness and in health, until death do us part." "...to have and to hold, from this day forward, for better, for worse, for richer, for poorer, in sickness and in health, until death do us part." In her caption, she wrote: "When I was about to get married I couldn't write my personal vows well. "I was thinking too much, wanting to express my whole heart to my husband to be on that day. "But the past few events in our life together as man and wife made me realize that all the cute things I said in my vows back then don't really matter when you come to a point of life and death. "What stays with you then, I realized, is to have and to hold, for better or for worse, for richer or for poorer, in sickness and health, till death do us part. "Did you see this already @josephbonifacio? I cried buckets writing and thinking and reliving the moment over and over." She and her husband Pastor Joseph Bonifacio recently celebrated their sixth wedding anniversary. LIFE GOT SERIOUS. 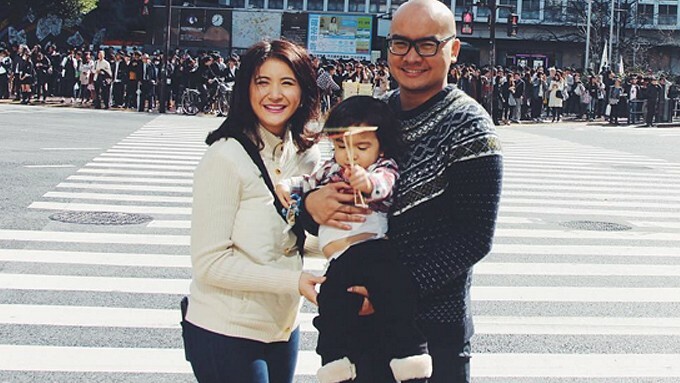 In her latest blog entry, Rica looked back on the six years of their marriage, and how much had changed since their son Philip was born. She recalled their early years as husband and wife. "Moving fast back then was never a problem. "We can experience three different time zones in a day and be sure that not a minute was wasted in any of them. "Then of course Philip came along and that taught me a valuable lesson: prepare three hours before you leave the house if want to arrive on time at your appointments, and add an extra hour if you want to come with unwrinkled shirts and wonderfully curled hair." Then fast forward to recent times, she talked about the lesson she learned from her second pregnancy. "[...] I had to do D&C [dilatation and cutterage] which happened the other day. "It was a simple medical operation so I didn't think I'd have to part ways with my phone and husband for a few hours before, during, and after the procedure. "But apparently, husbands are only allowed at births, so I had to bid him goodbye before I entered the recovery room. "What if something goes wrong, and I never wake up from my sleep?" Suddenly, the meaning of each line in the traditional wedding vows makes sense. "For the longest time I would hear these words float at those holy ceremonies, and I even professed them myself on our wedding day, but not until last Tuesday morning did I understand a part of what it means. "Of course, 'for better or for worse was easy to spot—it was established soon as someone farted under our shared blanket." Rica then emphasized on the value of the last part of the vow, "...the 'until death do us part'—I had to stop and think of how profound a promise that was, that it shall take the forceful blow of death for the two of us to stop having and holding each other. "Because at that time it felt like every ounce of energy I had and every life that is still within me, all I really wanted to do was to spend it by simply having and holding Joseph." At the end of the blog entry, Rica said, "The next life has its own promises, but in this one I am blessed to embrace the gift of my husband. "Honestly, I don't really like going through trying times, but for some reason, they are the ones that show me what our marriage is really made of and made for."